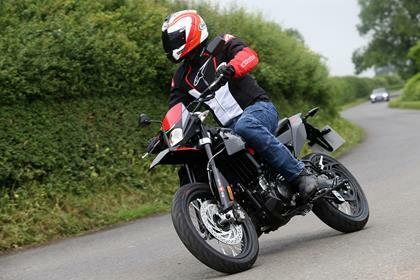 New this year, the supermoto Aprilia SX 125 and enduro RX 125 share a similar platform. Both bikes use the RS 125’s (or RS4 as it used to be called) fuel-injected, four-stroke, single cylinder engine that is housed in a steel double cradle frame. Boasting inverted forks, ABS, and smatterings of real-fake carbon fibre, not to mention typically-Aprilia aggressive styling, they look far more premium products than their impressively budget £3399 price tags suggest. 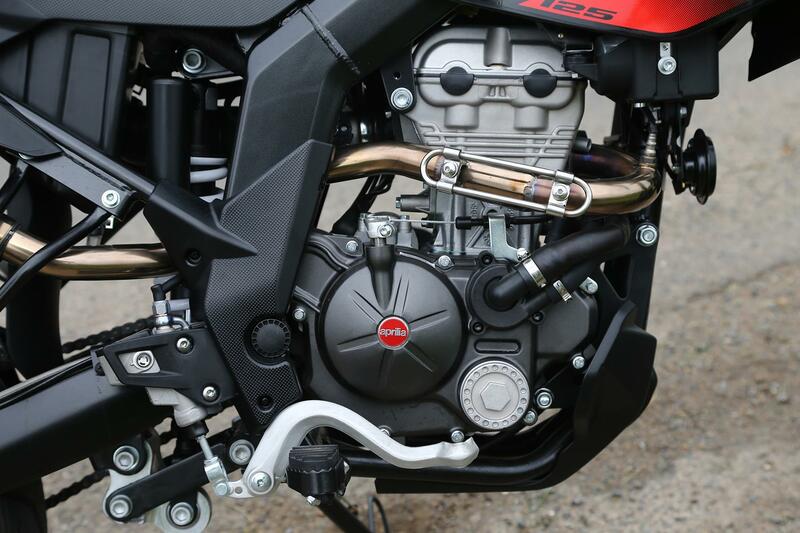 Are Aprilia onto a winner by spotting this hole in the 125cc market? The SX 125 has a ‘big bike’ feel about it and while the seat height is quoted at 880mm, it’s such a narrow machine with soft suspension that in reality it’s far lower. The riding position is relaxed with tall bars, which is good, but the seat is pretty firm. While the engine’s weedy exhaust note is a disappointment, it’s as fast as any four-stroke 125 with solid road holding meaning you can happily top 60mph, which is all you need. My only real criticism was the cheap dash, which lacks a fuel gauge and looks like it came out of a cracker. You always expect an Aprilia model to cost a premium, but at £3399 the SX is impressive value for money and backed up by some tempting finance deals, which you don’t always get with far eastern brands. The aggressive look and relaxed riding position that a supermoto style of bike delivers is good and the fact the SX comes with ABS is a bonus. Ok, it’s made in China and not Italy, but it’s the name on the tank that counts and the Aprilia brand still carries some weight behind it. The SX looks fantastic in the flesh and fits all shapes and sizes of rider, even those who have been through a recent growth spurt/McDonalds binge. The little single engine is reliable and sips fuel with 80mpg easily achievable, making the SX cheap to run on a shoestring. It sounds a bit puny, but that’s nothing a loud exhaust can’t rectify. The SX use the same four-stroke single cylinder 125 as the RS 125, which is a pretty advanced engine. It has four valves, double overhead cams and a fuel-injection system, so meets Euro4 regulations. Despite sounding pretty weedy, it makes the legal limit for a 125 and is impressively frugal to run with 80mpg easily achievable. By their very nature 125s get hammered to within an inch of their life, but you get a two-year warranty and the RS4 (which is now called the RS 125) has a proven reliability record. The lower level of finish tends to show up after a few years, but mechanically it should be sound. Unlike some cheap 125s, which have a combined braking system to pass Euro4 regulations, the SX has a Bosch ABS system on its front brake, which automatically reduces pressure to keep the bike level when braking hard, cutting out stoppies. 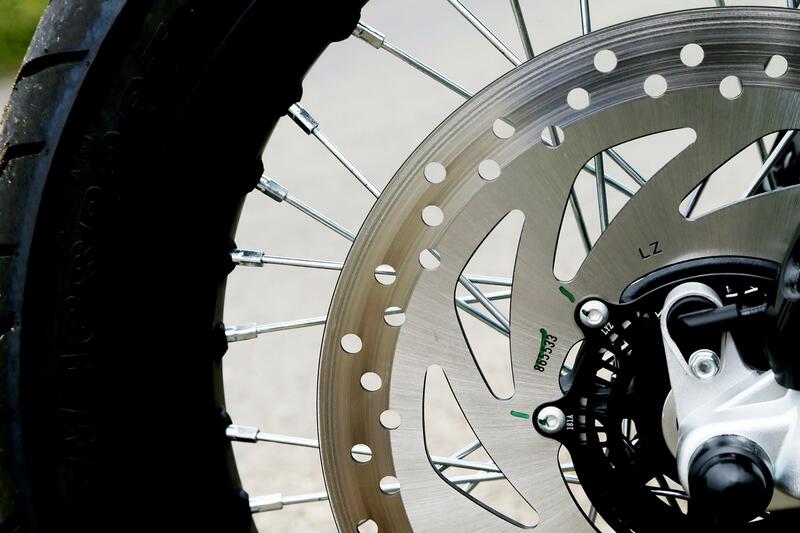 It’s a neat system and works well, giving newer riders a greater feeling of security than combined brakes deliver. 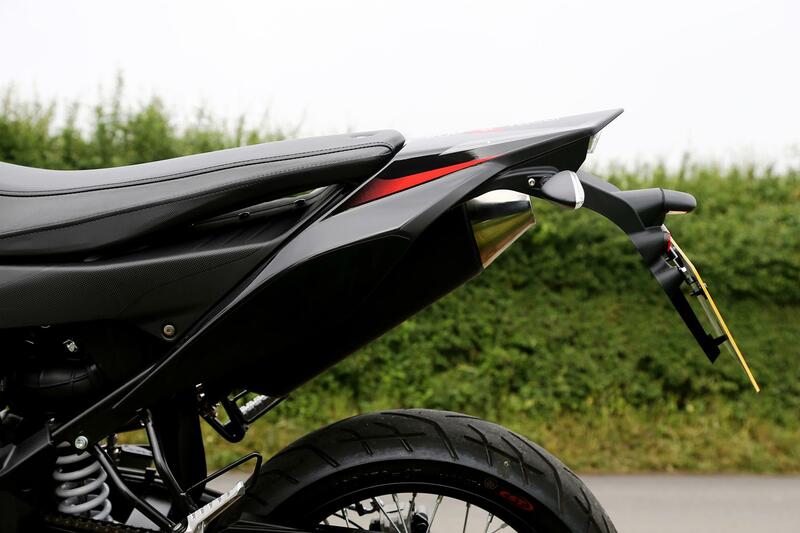 The rear brake has no ABS, so you can still do skids outside the youth club…The SX’s overall look is premium and it has inverted forks, however the LCD dash is cheap and nasty and a radial brake caliper would have been nice on the supermoto. The Aprilia SX 125 and RX 125 are new models for 2018. They are four stroke iterations of the two stroke Aprilia SX 125 and Aprilia RX 125 machines Aprilia made up until 2011. The RX 125’s styling is more off-road orientated and as such it comes with a 21-inch front wheel (with a smaller 260mm wave disc) and 18-inch rear with chunky CST tyres. But other than wheels and a taller 905mm seat height, the SX and RX are identical and share the same £3399 price tag. No owners have yet reviewed the APRILIA SX125 (2018-on).